Typical soil generally contains at least 45% inorganic components, 5% organic components, 25% air and 25% water on average basis. Organic carbon plays major role in biological activity and fertility of the soil. In different parts of the world positive correlation between the amounts of organic carbon and soil fertility has been proved. Indian soil ecosystems are very dynamic due to its sub-tropical climate, resulting rapid degradation of organic matter in these soils. Soil organic carbon content up to 1.5-2.0 % increases soil porosity that supports growth of the soil microorganisms. This increases availability of different nutrients to the plant, resulting in better crop yield. Thus organic carbon is a true indicator of the soil health. Also it is true that soils with sufficient organic carbon in it definitely contains other major elements like Nitrogen, Phosphorous and Potassium in more available form. There are difficulties to analyse organic carbon of soil regularly due to specific reagents, skills and proper setup that are available only at approved laboratories. 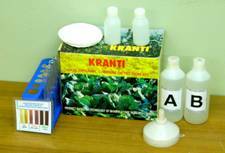 As these laboratories are in low number farmers are unable to monitor soil organic carbon on regular basis. Soil Organic Carbon Detection and Testing Kit developed at BARC, ideally a quick, accurate and field test will be able to guide the farmer for this purpose. It is user friendly as any farmer himself check the percentage of organic carbon in his field. It gives quick and reliable results. Evaluates the impact of organic carbon amendments supplemented periodically. It gives idea of amount of organic manure additions. It is economical and time saving. Direct use by the farmer for organic carbon detection of soil before sowing of the crop and at the harvest of the crop. To take the corrective measures to maintain the soil organic carbon at optimum levels and evaluating the effectiveness of the organic manure supplements. Agriculture universities & soil-testing labs for research purpose. This kit consists of different components and chemicals required for analysis of organic carbon. 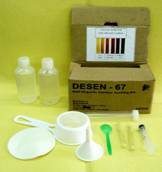 After collection of the soil sample from the field take one spoon of soil and add 10 ml of chemical solution A & 10 ml of chemical solution B. After mixing gently and allow it to stand for 10-15 min & filter through a given filter paper in the kit. Compare the colour of the clean filtrate with the given colour chart in the kit. The organic carbon content of your soil is the assigned value of most matching colour on the standard chart. All the raw materials used for manufacturing the kit are produced within the country and are available in local market. The development of kit requires small laboratory with distilled water facility, analytical balance for weighing reagents and magnetic stirrer for mixing reagent. One Chemist and one skilled worker would be adequate for the purpose. Various products developed by Entrepreneurs using BARC technology.